Thanks to Brausebart and his supporters, listed in the ReadMe, for an ingenious mod. Thanks to Bethesda Softworks for this brilliant and editable game. This is the English Translation-Patch for Brausebart’s excellent Mod “Abenteurerausstattung”. So all credits and endorsements (and especially my personal thanks) go to Brausebart. I appreciate the honour of his permission for the translation and I hope I did it well enough. I’m not bilingual, so please forgive me, if my English is a bit clumsy. Therefore please let me know, if you encounter any mistakes, which you think must be corrected. Updates: I have already made some updates, because I really missed to translate especially script effect names, which I cannot see in the CS. Thanks to ffa1mf I could already correct the most (all?) I hope. These Updates do not change the function of the mod in any way. 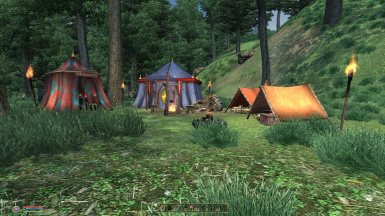 This Mod requires Oblivion EV with Patch 1.2.0416 and Shivering Isles. For installation instructions see further down. 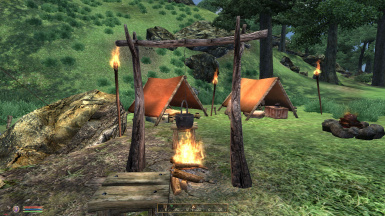 This plugin adds a transportable camp equipment with different accessories and some bits and bobs to the game. 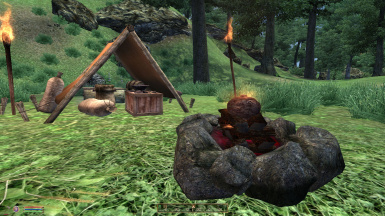 You can forge (lock picks), chop wood and prepare your food in the camp. Who likes, can acquire a wolfhound as faithful companion. Optional you can toggle hunger and fatigue for the character. In this case you have to eat and sleep from time to time, to keep your strength up. You can’t buy the Large Tent. You’ll get it as a reward after completion of the Fighter’s Guild Quest or as a Knight-Errant of the Order of the White Stallion. 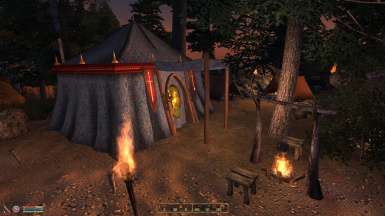 The Large Tent comes completely furnished and offers among other things a double bed, an Armor-Mannequin and some chests and sacks for storage. Furthermore: bath tub, music box, kitchen and more. Expandable with a permanently installed Alchemy-Set and a herb bag for automatic storage of unused ingredients after the brewing of potions. Furthermore there is a place for the preparation of lunch packs. The Luggage Tent includes containers for water and flour and a freely useable storage sack (no respawn). It is expandable with a workshop for the repair of the equipment and for the forging of lock picks and with a Magic Chest (sort of Everywhere-Chest, but with limited functionality). The Small Sleeping Tent contains a permanently installed bedroll and a chest. It is quite low-priced. A portable Bedroll for the use in the Medium Tent. 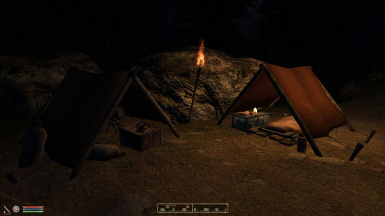 5 arrangeable torches for illumination/decoration of the camp in the night. 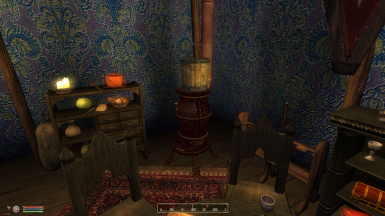 In the Cooking Pot you can prepare various meals and beverages. With the Forge and the Melting Pot you are able to melt down useless items as shovels, pitchforks and other metal parts to wrought iron. Afterwards the iron can used for the production of lock picks with the anvil and the toolbox. If the additional module bbLagerOptional.esp (see: ReadMe) has been activated, you are able to chop wood from the fallen tree trunks of the original game. Without the additional module the Axe is of no use. In this case, the required wood can only be purchased at Sepp Uldinger’s. "Flame of the North": A bright white beaming torch, that is operated by the magic of Welkynd-Stones. Staff and Spell of Return: A simple Mark/Recall-Spell with a target- and return-location. "Flight of Ikarus": A simple flight-spell for the character himself and eventually for Tramp, if the dog is following. May be Beolo is making an appropriate animation. Then there will be a flying broomstick in our main project. Such a thing would exceed my abilities regrettably by far. Magic Hourglass: Displays the ingame-time optional permanently or for short every half and full hour. 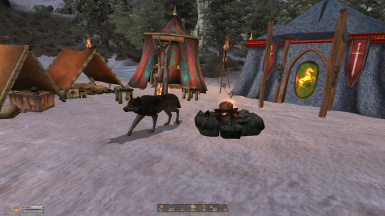 A new merchant located east of Skingrad on The Gold Road at the lower end of the Great Forest. Sepp is selling the first parts of the camp equipment and wood. Wood is required as building material for the tents and the Cooking-Site, but even so as firewood for the campfire and the camp torches. Who likes, may buy little Tramp at Sepp Uldinger’s and take him as a companion. You can feed him once a day with meat or dog biscuits, so that he will grow time by time and get stronger. But he will never get as big as to be mounted. End of the original description. 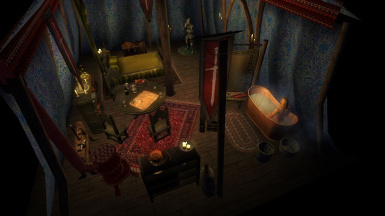 Together with the optional Hunger and Sleep module, Brausebart’s ultimate survival pack for the travelling adventurer offers a huge lot of role-playing-possibilities and a great atmospheric immersion. The mod is a quest in itself. It gives you a reason to visit more merchants as you would have ever done ever. It gives sense to more or less useless food or worthless items like tongs, callipers, scythes and so on. It let’s you drink from open water or from wells and you can even milk sheep. For your enjoyment of this mod, I strongly recommend that you read the enclosed ReadMe and all the in-game books and instructions. Otherwise you won’t know where to find and how to use and operate the items! If you need immediate support, there is a Hint and Troubleshooting Guide and a list of merchants selling the equipment, for download in Camper's Little Helpers. and load the file version 1_1 down and unpack the files to a location of your choice. Drop the folder “Data” in your programs/Bethesda Softworks/Oblivion folder and allow the integration. 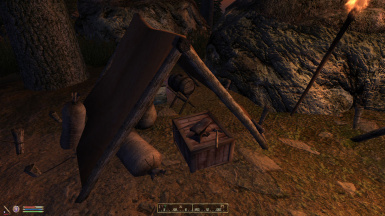 Then go to this “Adventurer’s Equipment” site and load the file down and unpack it to a location of your choice. Drop the folder “Data” of this English translation in your programs/Bethesda Softworks/Oblivion folder, allow the integration in every displayed folder and allow the substitution of the files “bbLager.esp”,“bbLagerOptional.esp”, bbDunklereNaechte.esp and the other texture files. Three years ago I stumbled over Brausebart’s Mod “Abenteurerausstattung” and it turned out to be one of the best mods I’ve ever installed. There were so many folks out there, who asked for a translation in English. The years went on and nobody sacrificed himself to this task. Well, now I know why ;). I translated the Abenteurerausstattung_Readme.pdf, all the names of items, ingredients, spells, activators and so on, the books and instruction manuals, the locations, doors, map marker, quests, the messages and message boxes in the scripts of the bbLager.esp and bbLagerOptional esp. I made a few new book textures, signpost textures of Sepp Uldinger’s hut, which are to be found in the Textures folder and will override the original bbLager.bsa in game. I was forced to correct some begin/end command errors in the ghost-scripts (twice “endif” in a block) and another script I had to change “elseif” to “if” because the script compiler prohibited me from saving the script otherwise. There was no influence on the execution as far as I tested. I altered (shame on me) the bbCampFirePlacerBurnedScript in line 131 and 132. This because of a bug with the burned campfire placer, after it is picked up (activated) and taken into the inventory. If you drop the burned campfire placer from the inventory, the script places the non burned campfire placer at you (PlaceAtMe) and “Oskar the Chute” removes the burned campfire placer so that it can’t pile up. But this causes the “Activate Key” to completely loose its function. The campfire placer can’t be held in the air and drops onto the ground. Game over, because from now on you can’t activate anything at all L. So I removed the burned campfire placer from the inventory and added the normal campfire placer – and that’s it. I tested it over and over and it worked reliably. 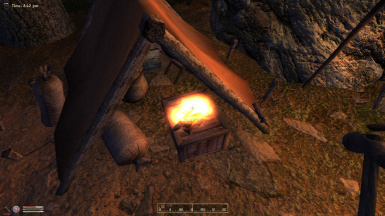 By the way, the same thing will happen, if you try to set up a camp torch in the interior: you can’t activate anything anymore: game over, your caught in a trap. So just don’t do this. Apart from that, fire in interiors is absolutely against the Cyrodiilic Regulation of Fire Prevention and really irresponsible. I didn’t change this bug, because the deliberate provoking of a Mini-Kvatch has to be punished indeed ;). The language used by Brausebart in the books and instructions is a poetical and illustrative German. I hope I was able to convey a bit of his humour and the atmosphere, which is perfectly fitting into the Tamriel world. So for example if you are dismissed from jail, you have “Kohldampf”, which is ravenous hunger, but really says “Cabbagge-Steam”, the bloated feeling in your belly, after you had nothing to eat before but boiled cabbage. I haven’t found any adequate expression in English yet. I thought I had to alter the original names of the dogs “Susie” and “Strolch”, because they refer in a specific sense to the German title of the Walt Disney film “The Lady and the Tramp”. So “Strolch” became “Tramp” and “Susie” “Lady”. The use of the file is at your own risk. I’ve tested the mod with about 60 other mods and didn’t encounter any severe issues (except with the music box, that won’t do any harm, if turned off).